With the emergence and structuring of the Lucanian ethnos during the fourth century BC, a network of cult places, set apart from habitation spaces, was created at the crossroads of the most important communication routes of ancient Lucania. These sanctuaries became centers of social and political aggregation of the local communities: a space in which the community united for all the social manifestations that, in urban societies, were usually performed within the city space. With a detailed analysis of the archaeological record, this study traces the historical and archaeological narrative of Lucanian cult places from their creation to the Late Republican Age, which saw the incorporation of southern Italy into the Roman state. By placing the sanctuaries within their territorial, political, social, and cultural context, Battiloro offers insight into the diachronic development of sacred architecture and ritual customs in ancient Lucania. 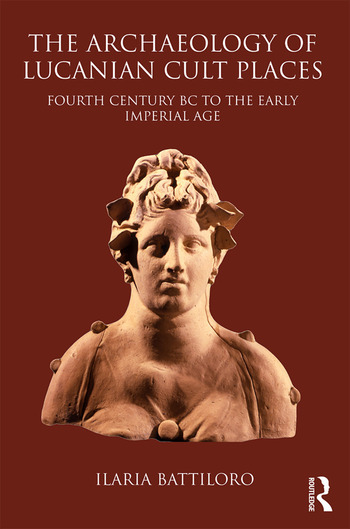 The author highlights the role of material evidence in constructing the significance of sanctuaries in the historical context in which they were used, and crucial new evidence from the most recent archaeological investigations is explored in order to define dynamics of contact and interaction between Lucanians and Romans on the eve of the Roman conquest. 1.3 Social Structure: Oligarchies and "Intermediate Groups"
1.6 The Lucanian Settlement Model: an "Urban" Phenomenon? 3.3 Lucanian Cult Places and the Emergence of the "Intermediate Groups"
5.3 Social Transformations and the Vanishing of the "Intermediate Groups"
6.3.4 Rossano di Vaglio in the wider context of "Italic Hellenism"
Ilaria Battiloro is Associate Professor of Classics at Mount Allison University, New Brunswick, Canada. She is a Classical archaeologist whose research mostly focuses on the sacred architecture and ritual practices of pre-Roman Italy.